If you've been following my blog for a while, you'll know that I have a big fan of scrub. Every month I have tried some new scrub on my face or body so let meet the latest addition to my scrub collection and now this is one of my new favorite face scrub for my dry skin. I adore the texture of the scrub and the miracle properties it has, which are fantastic for my dry skin. Face scrubbing is one of the important rituals which giving us healthy, clean and smooth skin. During face scrub, the exfoliating granules help to slough off dead skin, and the gentle rubbing action itself increasing blood flow to the skin’s surface that helps to improve skin texture from inside and out. This scrubbing process can reveal the fresh, clean, and rejuvenated skin hidden under the layers of dead skin cells, grime, and sweat. Scrubbing can make the skin soft and supple, revitalized and invigorated. So you can accumulate scrubbing during your daily skincare routine. The scrub comes in a sizeable squeeze tube with a narrow nozzle that controls even the tiniest amount of product well when dispensing. The tube is secured and has a white flip cap, which is quite sturdy and tight enough. This kind of packing is absolutely travel-friendly. The packaging is quite decent, lightweight and travel-friendly. It has a soft and a very smooth texture with micro-exfoliating light brown and white granules of peach extract and Himalayan Rock Salt. 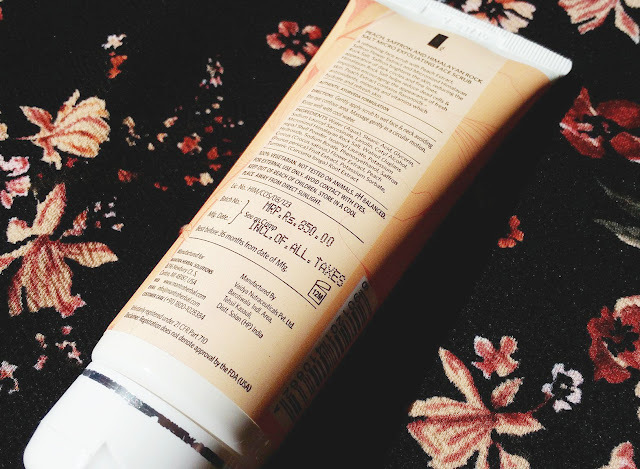 This face scrub has creamy and bit runny consistency, which is almost like a moisturizer or body lotion. The scrub off-white in color. It has a refreshing fragrance which isn’t too bothering. 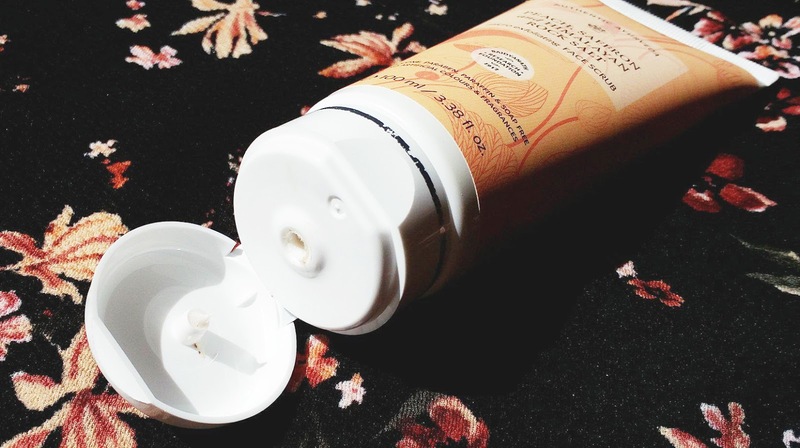 The exfoliating granules are very fine, it’s an off-white color and smells not to bother you. This face scrub enriched with some really very good natural ingredients and it is claimed as a totally chemical free product. 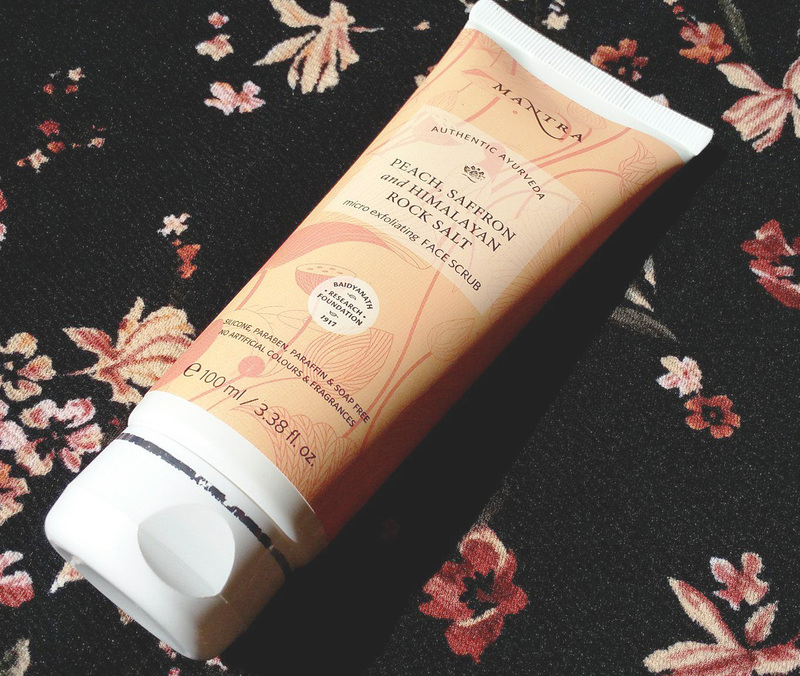 A revitalizing face scrub with Peach Extract, Saffron Flower Extract, and Micronized Himalayan Rock Salt. Saffron brightens the skin, diminishing the appearance of dark circles and fine lines. Himalayan Rock Salt helps to remove dead cells and impurities and reduces spots, pimples, face blemishes & other skin imperfections, encouraging the appearance of fresh skin. Peach Extract contains flavonoids – antioxidants, minerals and vitamins which hydrate and revitalize skin. I apply this scrub on my face (just keep it well away from your eyes) with circular and outward strokes to exfoliate impurities. I leave it on for about 2 to 3 minutes, then I wash it off. You can use it just twice or thrice a week should be enough to keep your skin calm and happy. The exfoliating particles are not harsh on the skin. I have been using this product for a week now. This scrub has micro-particles so you feel it very light on your skin. It cleans the skin very nicely and you will feel softness and smoothness on your face. I love using this all over my face and neck as an effective way to exfoliate dull, dead skin cells and it's great to use it makes your skin feel so wonderfully smooth and moisturized. My skin is smooth, clean and refreshed each use. I love how this does not dry out my skin either. The results were definitely worth it as my skin was left silky soft and it felt moisturized too. My dry skin also loved the cream formula as it provided an extra boost of hydration and this combined with the scrub element and left my skin feeling silky soft and smooth. Definitely, one I'd recommend trying out. I am a big fan of scrubs. Let me keep this in my wishlist. I love to try this Brand..sounds really good.. I recently used a face wash and a conditioner from Mantra and I really liked the efficacy & authenticity of the products. This scrub too looks nice. Shall try it. It sounds like very good scrub for dry skin. My mom has dry skin, so will recommend this scrub to her. Great to know that it does not dries out skin, i was looking for something which does not dry my already sensitive skin. This scrub seems too good. This seems like a great scrub fir dry skins..I have normal to dry skin and i will give it a try ..